...Just wanted to say that I am very happy with OnyxGARDEN SuperBundle. Fast render times and stabile workflow with Vray + Max. Great! Since TREE STORM models trees directly into the scene. 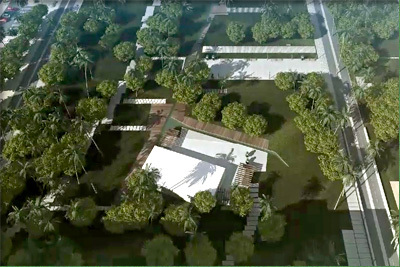 Thanks to the fact that no data files are generated, the modeling-in and positioning of trees on the scene is fast. 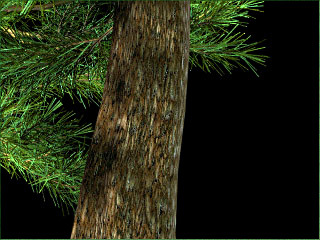 Besides extremely fast modeling, TREE STORM enables you to choose the detail and resolution of a tree prior to actual modeling. Also, once the tree is modeled in the scene, it takes just a moment to go back, adjust the detail and resolution of the tree, and remodel it again. You can even change this tree by adjusting its random seed, or replace it with another tree from the library. Once a tree has been positioned on the scene, you can change it by adjusting its random seed. Or, you can enable random variation in TREE STORM Parameters rolout prior to actual modeling and then proceed with the positioning. Just start by clicking the mouse in the top viewport and the trees are there - each slightly different from the previous one. This is ideal for building tree-lined streets, tree groves, and a forest. When you put trees into Max scene with TREE STORM, the default material setting for these trees is color-per-vertex. 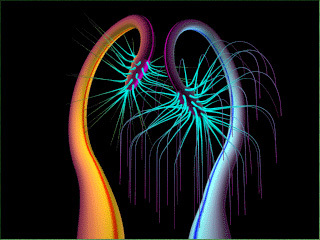 The colors are set in OnyxTREE BROADLEAF, OnyxTREE CONIFER, OnyxPALM, or TREE CLASSIC, read by TREE STORM, and displayed as Max's color-per-vertex materials. The colors you set in Onyx modelers will not only produce beautiful and highly realistic results, but will also save you quite a bit of rendering time. Therefore, you will not have much need to texture map trees. you can get with color-per-vertex. If you still wish to use your own textures, you can do that too. 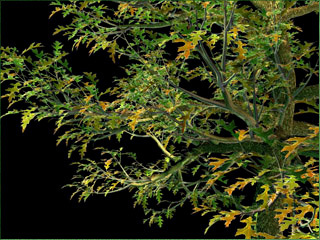 Just check the UV for any class of tree elements and TREE STORM will deliver a tree with the UV coordinates enabling you to apply texture maps in Max that will follow the direction of growth of each branch being mapped. The trunk is texture mapped in Material Editor. The texture follows the trunk curvature. If you wish to texture map a real leaf onto the leaf objects, you can do that as well. Just specify the number of leaf sub-materials and replace the leaves with the "plates". TREE STORM will deliver a tree with the leaves grouped into the specified number of sub-materials. Each leaf will assume the form of a rectangular surface for easy texture mapping with Material Editor. First set leaves as "plates", then texture map them. TREE STORM gives you these preview choices: Symbol, Envelope, Full Detail. The symbol preview is the fastest and the most economic form of preview, while the envelope preview gives you the mass and shape of the tree with the minimal number of polygons. Choose tree in the symbol or envelope form for positioning it on the scene - the camera will render it in full detail. You can move these symbol and envelope trees around the scene in a fraction of time it would take you to move around the fully detailed tree. Extra useful time saver! If you wish to see trees moving on the wind, set the wind speed, direction, turbulences, and gusts, activate the wind, and position the trees on the scene. No manual work, just set the parameters, and render. TREE STORM will do its jobe beautyfully, managing all the trees during animation. You have to see it to believe it! Truly impressive!! Max 2014 or Max 2013. The previous TREE STORMs require the respective Max 2012, Max 2011, Max 2010, Max 2009, Max 2008. PC with Intel, AMD or compatible microprocessor. 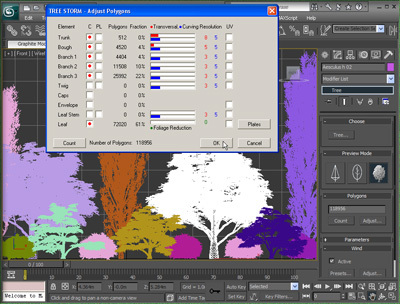 Download azip file containing TREE STORM plugin, manual, auxiliary files, and TREE CLASSIC parametric modeler.